Ever wanted to play guitar like Jimi Hendrix, but didn't know how to mimic his trademark sound? With the Line 6 Pocket Pod, you can. The latest in the acclaimed series of Pod pre-amps from Line 6 may seem small, but it's packed full of more classic rock sounds than a roadie's record collection. About the size of a standard guitar tuner, the Pocket Pod works as a digital pre-amp that allows the user to mimic the sounds of classic amplifiers and effects pedals. Just plug in your guitar, link the Pocket Pod up to either your amp or your Mac, and you can sound like classic guitarists from Eric Clapton to Jimmy Page. The Pocket Pod comes loaded with 48 classic amp and cabinet models, along with a further 300 custom presets, which include over 100 supplied by bands such as Maroon 5 and Razorlight. 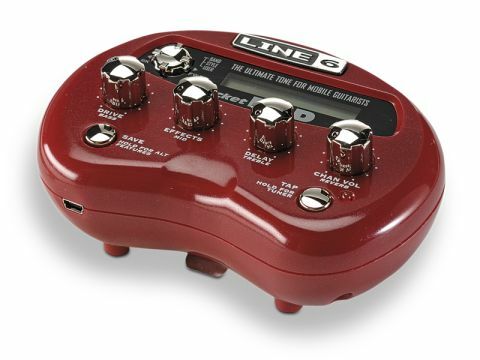 You can also create and save your own sounds at the push of a button and a twiddle of a knob, or download yet more from the Line 6 website. Once saved into the Pocket Pod, you can 'deep dive' into your presets with ease on your Mac using Line 6's Vyzex software, in order to fine-tune your sound before you record it. Although the Pocket Pod is at its best when plugged into a Marshall stack with some classic rock pumping through it, it can also be invaulable in the home studio and makes an ideal companion to either Logic or GarageBand. It plugs into your Mac using the easily accessible USB cable and you can even plug in your iPod using the Pocket Pod's headphone socket and jam along to your favourite songs. Although not as feature-packed as Line 6's more professional models, such as the Pro X3 or XT, it's almost a quarter of the price, making it the perfect beginner's model. Its portability and ease of use make this a must for any home Mac musician. The days of your home studio being cluttered with effects pedals is over.